So I uploaded all the essays to the new FTP site, yippee! at last! scoins.net. Then I eventually got round to a little maintenance, having found that the date order that iWeb blog wanted to do was not the order I had previously given to the essays. So some dates were fabricated and lots of shuffling occurred. Then I thought to try to re-arrange the references so that people who want to follow a thread, such as language, could go to an equivalent of the header page I had previously and laboriously constructed – and which may have been the source of many of the obstacles to saving the resulting file. One result was that the whole website collection reduced to 68MB from 180MB. Another was that Essay No13 was labeled Censorship and so is a duplicate of Essay 34 – but NO; 13 in content is a repeat of Language 2, No 12. Unlucky for some. Unlucky 13, for some. Here, the unlucky number is 4, si4. Because si is four and dead – and a few other things: a plough, spoon, trunk, river bank, rhino, the verbs to watch, to seem, sacrifice, rear and feed. I need to write a page in homage. To anglos, think suh, not see, C or the italian si. It is a 4th tone, downwards, as if angry. Buildings here often have no nominal 4th floor, or it is numbered 3A, or it is a plant layer (plant = machinery to keep the building going, such as air-conditioning); 14, if it exists at all, will house foreigners presumably happy not to be on 13, but just as often the numbering just omits the 4, the 14 and so on. So while the ground floor (US & China 1st) is 1, the twenty fifth is 22 and the 45th is possibly numbered 601.
c) If the two counts differ by d = F-N, what values of d do not exist? Why do westerners judge 13 to be unlucky? I found a suggestion that the 12.41 lunar cycles in a year (lunations?) means that the 13th in a year—the blue moon2, when it happens—is full of portents (bad ones, perhaps). Way back in ancient Mesopotamia 13 was bad luck and the 13th day of the Iranian year is still cause to empty cities just for that day (why? Some sort of race memory of an earthquake?). Wikipedia tells me that the Mayan calendar agrees 13 is bad. 13-moon years are a little more common than leap years, so not unusual by any means. Further checking late in 2012 showed that a page about Graduation has disappeared, which belongs in July 2008. in 210406 I found hat essay and added it to the end of essay 31. 2 I do not think a ‘blue moon’ is the 13th of a year but instead is the occasion of the second full moon in any month. Since they occur at 28 day intervals, there is possibility for two in any (or every) month except a non-leap February. The picture above is, you’re right, of Hogwarts. 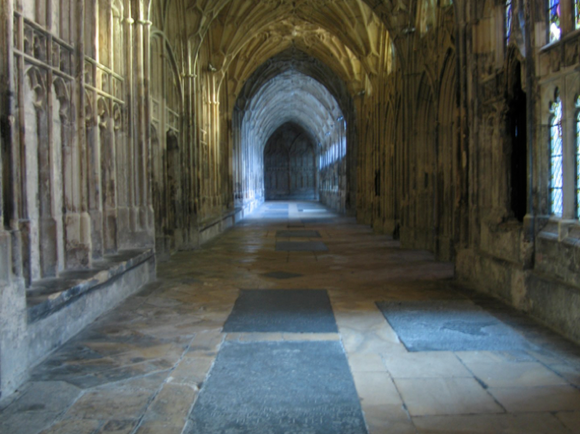 But it isn’t, because it is also a corridor inside Gloucester Cathedral, the northern cloister I think. When we were there, C’s recognition was immediate, while I was merely thinking ‘familiar’. I still feel bad about taking photos on Church ground. Please explain this to me. This essay is particularly poignant in May 2016 for I have had another disaster and am having to load the pages on the website back into iWeb. Which sounds completely mad, but iWeb is the form I use for generating pages and the domain file of some 400Mb was somehow lost when trying to do what should have been a trivial fix of a Mail problem. Two weeks later I have still to re-input all the essays, fix all the links throughout everywhere. And that is only the fix for the website; the domestic accounts have rewound to February—which is a big improvement on the first level of disaster, where the whole disk wound back to 2009. I think *it* hit the fan, don’t you?